Balanchine’s three-act ballet Jewels has become a global phenomenon. This autumn the ballet returns to New York City Ballet, the company for whom it was originally created (don’t miss this recent video where NYCB dancers Jenifer Ringer, Sterling Hyltin and Sara Mearns discuss each act), while the Royal Ballet presents this season’s final performance on Wednesday. Jewels is also being released by the Mariinsky on DVD/Blu-ray (and an older DVD version with Paris Opera Ballet also exists) with our dream cast for Diamonds: Uliana Lopatkina. Go if: You like to mix & match different ballet styles or you want to take a crash course on Balanchine. This particular piece covers all his styles and influences. 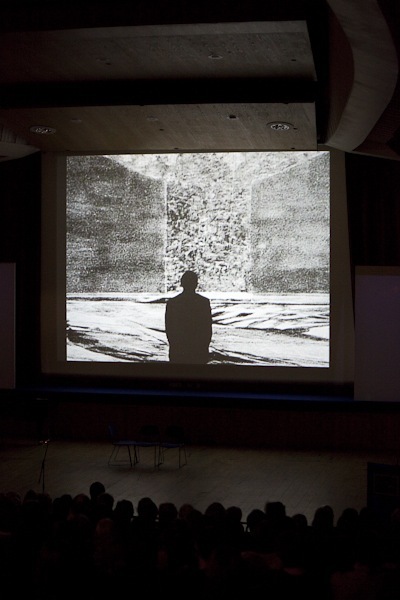 Skip if: You do not fancy abstract, plotless ballets. That would be a shame though, as between Emeralds, Rubies & Diamonds there might be at least one rock that is right for you! Jewels is said to be the first full-length abstract ballet, although in reality, the ballet features three independent acts – each with music by a different composer, choreographed and designed to an individual style – linked by the common theme of gemstones. The story as to how Balanchine came up with the inspiration for Jewels also varies: according to one, jeweler Claude Arpels would have suggested it after inviting Balanchine to his showroom. In another, the idea came when Balanchine was trying to buy a ring for his muse & beloved, the ballerina Suzanne Farrell. 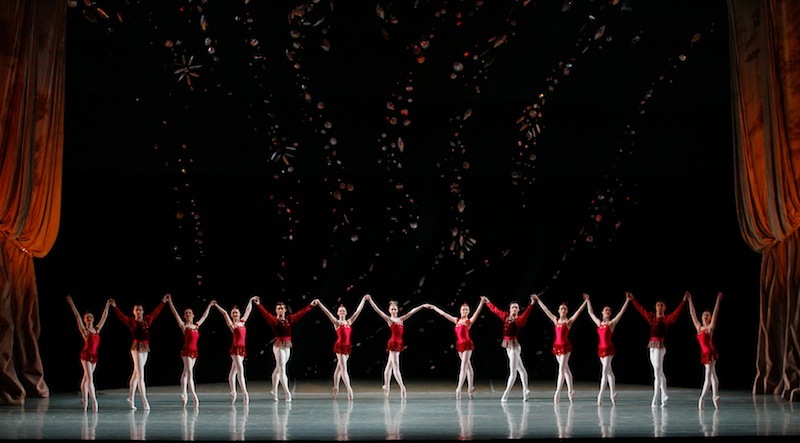 Despite having claimed that the ballet had nothing to do with actual jewels, Balanchine did evoke the colour and glitter of jewels in dancing – watch for the elaborate floor patterns and shaping of groups, reminiscent of necklaces and chains – and on the dancers themselves. For this, Barbara Karinska, his long time collaborator, created distinct, matching looks for each section of the ballet. The costumes were also designed so that the dancers could move freely, to meet the demands of Balanchine’s choreography. Given that most of the glitter would come from the reproduction of the stone colours and their sheen in costumes and dancing, the settings were relatively simple, with some jewels to reflect the lighting. Perhaps for this reason, ballet companies around the world have certain artistic freedom in choosing stage settings for Jewels, whilst the costumes – with the exception of Paris Opera Ballet’s – remain true to Karinska’s original creations. The Royal Ballet for instance has set designs specifically created by Jean-Marc Puissant. The opening piece, Emeralds, is set to music by Gabriel Fauré. This is Balanchine’s ode to Romantic ballets, hinted at not only in the long, Romantic-style, tutus, but also in the choreography: fluid, airy and delicate, full of floating bourrées, Giselle-like balances and sinuous steps. It evokes 19th century Paris and French ballerinas of that era. With a small corps de ballet of ten women, three soloists and two leading couples, the piece starts with an opening Pas de Deux from the first couple, two solo variations for the ballerinas, a vivid Pas de Trois (one of the highlights of Emeralds), a Pas de Deux for the second leading couple and an ensemble finale. If Emeralds is about 19th century “Romantic Paris”, Rubies brings us nearer to jazzy America in the Thirties, thanks to Igor Stravinsky‘s extremely energetic and syncopated “Capriccio for Piano and Orchestra”. Here the costumes are short, “Ballet-on-Broadway” looking skirts for the girls. The choreography attempts to display all the different twists in the music, so one sees angular shapes, high extensions, jutting hips, flexed feet and more. Due to its “wow factor” Rubies has been the most successful of the three sections and is often performed independently of the other two. Dancers usually compare performing in Rubies to running a marathon, given the required stamina. 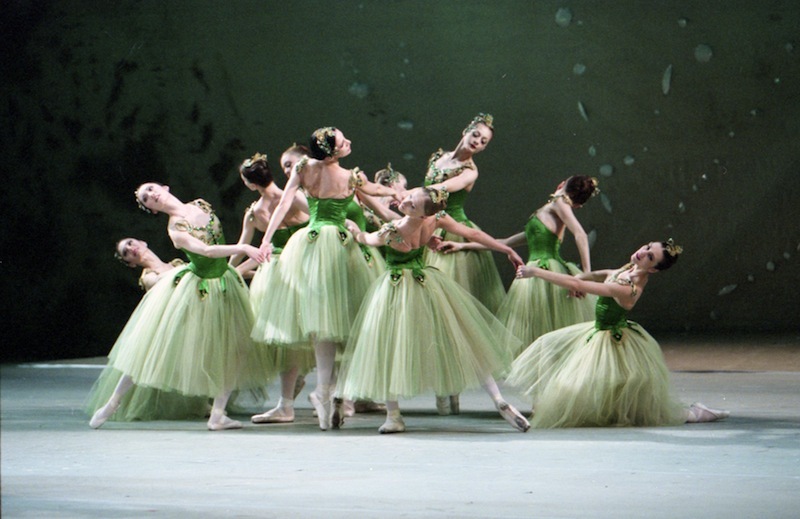 The ballet has a leading couple, a female soloist and a corps of eight women and four men. After the ensemble opening, we see a solo for a tall, Balanchine-type ballerina, a very sparky Pas de Deux for the leading couple and a real marathon of a finale, where the dancers prance and chase each other, like “racing horses”, full of fun, energy and intensity. This final section, with its choreographic nods to the Imperial Russian Ballet schooling and to Petipa‘s classical masterpieces, is Balanchine’s homage to both his grand ballerina Suzanne Farrell and to Russian tradition. Unsurprisingly, Balanchine chose a Russian score (Tchaikovsky‘s Symphony No. 3) and dressed his ballerinas in wonderful white tutus. 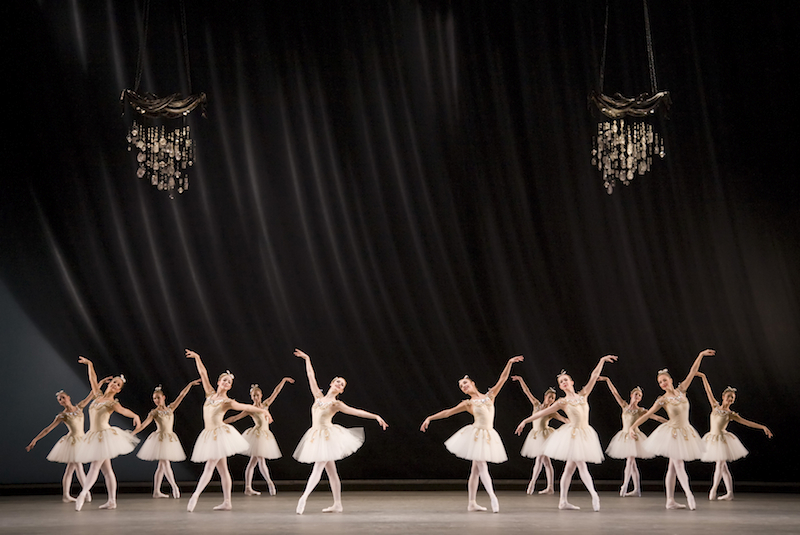 The ballet opens with a waltz for a corps de ballet of twelve women and two soloists. The next movement is a regal Pas de Deux for the principal couple, structured in the classical tradition, with an extended adagio and variations – think Sleeping Beauty, Raymonda, Swan Lake and La Bayadère all rolled into one – followed by an even more spectacular final polonaise (a crowd-pleasing, applause-generator essentially), where all the dancers return to the stage forming intricate swirling patterns, as if replicating Diamond chains in their dancing. In short, even though Jewels has no underlying story and is, effectively, a “mix and match” of independent sections unified by the overall “gemstone” theme, on stage the mix of dancing styles and music wraps up mood, excitement and drama in one dazzling, vibrant package. Gabriel Fauré. Pelléas et Mélisande (op. 80) and Shylock (op. 57). Igor Stravinsky. Capriccio for Piano and Orchestra. Pieter Ilyich Tchaikovsky. Symphony No. 3 in D major op. 29 (omit first movement). Premiere: NYCB at New York State Theatre, April 13 1976. Patricia Neary speaks for the ROH Podcast. Available to download free from iTunes. What to Wear to the Ballet? I saw it a few weeks back during NYCB fall season. I’ve only seen a few ballets but I prefer the non-story lines. So I liked it. And the NYS theater (aka David Koch) is great. It’s really three distinct short (maybe 20-25 minute) ballets. Thank you Hannah, glad you enjoyed! Music note: If you want to listen to the Jewels music, you’ll discover two albums under Balanchine that are very useful — one called the Balanchine Album and the other Balanchine Ballets. The first one only contains the Emeralds music. The second one contains all the music for Jewels. They’re both available on Amazon and Spotify for US listeners at least. Not sure about UK-other countries.